Here we have another special edition smart fortwo minicar. 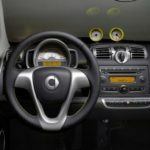 Smart drivers (the car, not intelligence,) in my experience are insanely smug about their cars, much like the Toyota Prius, and love to make it their own with smart’s customization options. Offering special editions with exclusive colors and options similar to Scion’s Release Series lineup gives owners a chance to stand out, which is obviously of utmost importance to most of them. The smart fortwo edition greystyle (all lower-case of course,) features a matte grey finish with matching 15–inch 6-spoke alloy wheels, a black “tridion cell” as they call it, and contrasting bright yellow highlights on the side mirror caps. 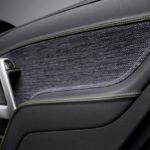 The color scheme carries over inside with black nappa leather and grey fabric, yellow stitching and yellow accents abound. 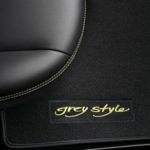 The edition greystyle can be had in either coupe or cabriolet models, and you can choose from a 71 hp engine with micro hybrid drive or an 84 hp engine. With the micro hybrid drive, the smart features an automatic engine start/stop feature that shuts down down the engine when braking (and traveling under 5 mph,) then starts again when the brake is released. 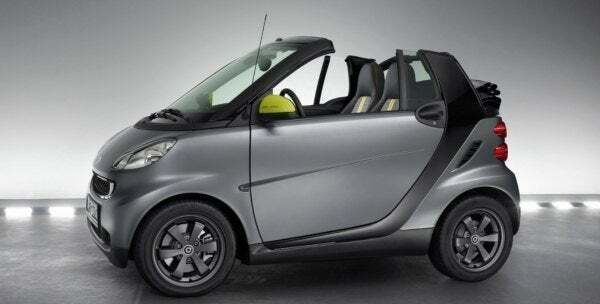 Smart promises that this will give around 20% fuel economy improvement. 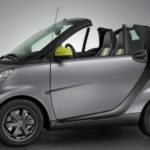 No Comments on "smart fortwo edition greystyle"